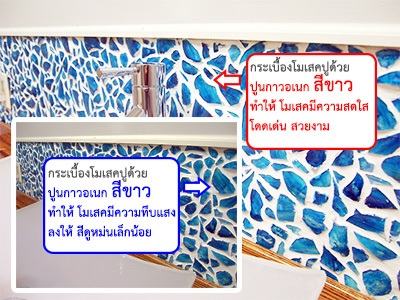 Repairing Application Guidance1. 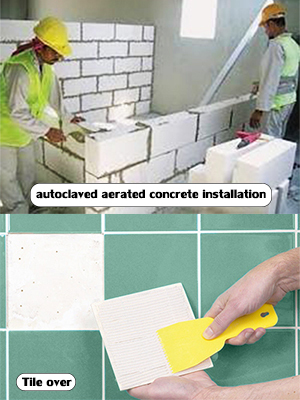 Concrete surface must be rigid, clear and free of contaminants that could prevent a good adhesion. 2. 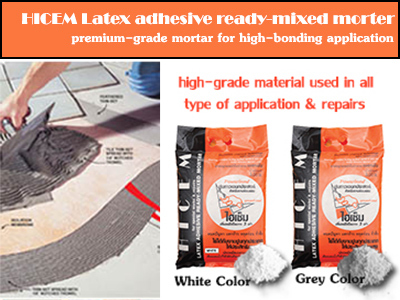 Old,cracked or broken concrete or plaster should be removed to provide a stable base for the hicem latex adhesive ready-mixed mortar. 3. If the concrete or plaster surface is cracked or uneven, it must be sufficiently smooth to accommodate a mortar application of 5-10 mm. 4. If the surface to be repaired is not in good condition, it should be pretreated with Hicemflex Latex Adhesive Emulsion to increase bonding strength. 5. Prepare Hicem Adhesive Ready-Mixed Mortar into fresh water in proportion of 3:1(by volume), stirs briskly about 5 mins or until well blended. Let stand for 3-5 mins. Do not add water.Mixture will be viable for approximately 30-40 mins. 6. 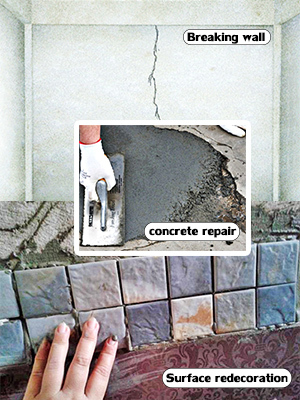 Apply mortar to smooth, flat concrete surface.